Spawned by fast-paced progress in new materials and integrate circuit technology, the past two decades have witnessed tremendous development of humanoid robots for both scientific and commercial purposes, e.g. emergency response and daily life assistant. At the root of this trend are the increasing research interests and cooperation opportunities across different laboratories and countries. The application-driven requirements of high effectiveness and reliability of humanoid robots led intensive research and development in humanoid locomotion and control theories. In spite of the progress in the area, challenges such as unnatural locomotion control, inefficient multi-motion planning, and relatively slow disturbances recovery set further requirements for the next generation of humanoid robots. Therefore, the purpose of this work is to review the current development of highly representative bipedal humanoid robots and discuss the potential to move the ideas and models forward from laboratory settings into the real world. To this end, we also review the current clinical understanding of the walking and running dynamics to make the robot more human-like. Since the first robot design mentioned in the text of Liezi around 250 BC , the humanoid robot has been investigated for centuries. However, the first full-scale humanoid robot, WABOT 1 , was only being built in 1973 by Waseda University, Japan. In other words, modern robotics is still a relatively new research field. Walking dynamics and dynamic control are the two major concerns while utilising the bipedal humanoid robot platform in daily life. Kinesiology is the study of human movement, typically pursued within the context of sports, art, and medicine . Walking is one of the most common activities, and ideal walking is performed to prevent falls and the associated injuries . Similar to walking, running is also the fundamental movement using the interaction between the muscles and joints of lower limbs. It requires the foot to be sufficiently pliable to absorb the impact forces and to be relatively rigid to withstand the propulsive forces. Understanding the kinesiology foundations enable us to optimise the functional movement as well as the practice of rehabilitation. The robust natural bipedal walking robots require the development of essential control strategies such as swing speed-up, step adjustment, and force feedback. Different conventional control strategies have their functions: passive control strategy enables the bipedal robot to move forward in a down-grade surface, the preview control strategy is used to adjust the future foot positions, and model predictive control strategy is applied to improve the step adjustment functions. To bring attention to the above-mentioned topics in this paper, we overview the kinesiology of the musculoskeletal system and the recent trend in the bipedal humanoid robots with state-of-the-art applications. The strongly interdisciplinary research area not only underpins the future of the topics related to bipedal humanoid robots but also indicates the importance of encouraging researchers and experts with diverse backgrounds (e.g. clinicians, engineers, and programmers) to work together. The remainder of this review is arranged as follows. In “Walking dynamics” section, the fundamentals of the human walking mechanism are introduced. Both of the human kinematic and kinetic systems are described according to the three cardinal planes of the body. Several measurements and analysis approaches are listed. 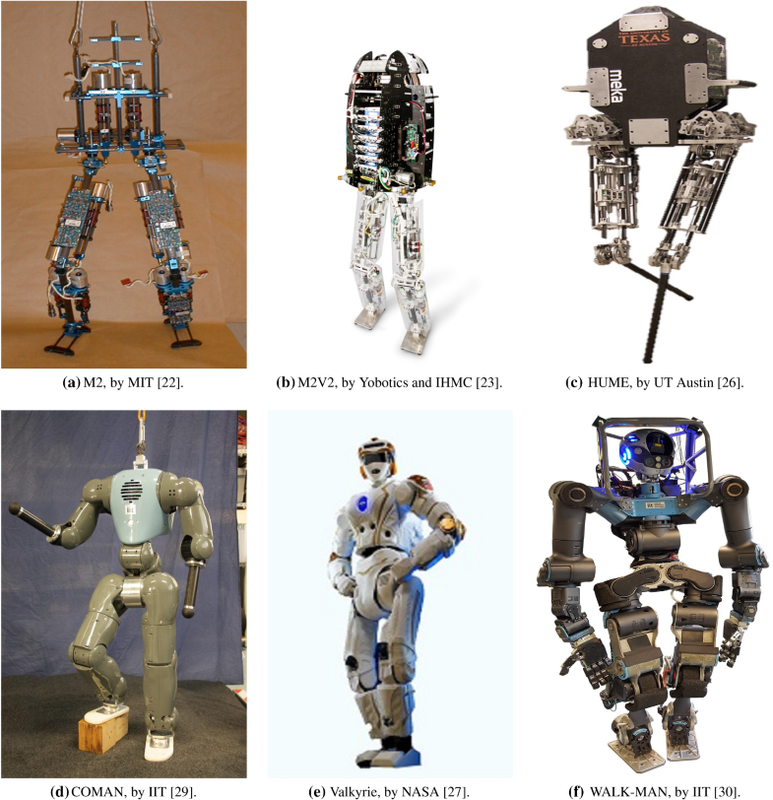 In “Legged robots” section, different generations of the legged robots are demonstrated and compared. In Dynamic control of bipedal walking” section, control approaches used to enable bipedal walking are explained. In “Running dynamics” section, running dynamics are identified compared with simple walking dynamics and different strike patterns and potential running injuries are also included. “Challenges and future trends” section summarises the major limitations, challenges, and future trends of bipedal humanoid robots. Main conclusions are drawn in “Conclusions” section. Defined in , “Walking uses a repetitious sequence of limb motions to simultaneously move the body forward while also maintaining stance stability”, it is a convenient means for travelling short distances. To better understand the whole-body movements, the accurate description of an individual’s joint axes, foot motions, and ground reaction forces from consecutive strikes are needed. Different methodologies and motion-captured protocols are introduced in this section. To conserve the total energy by reducing the required muscular effort. During walking, two limbs move the body forward simultaneously with both feet contacting the ground, along with the transfer of the body weight between the limbs. One single sequence of walking by one limb is called one gaitcycle (GC), or one stride . The term initialcontact (IC) will be used to describe the onset moment of floor contact , i.e. heel strike. In general, there are two phases of a period in one GC: the stance period and the swing period. Stance is the period in which the entire or part of the foot is on the ground while swing is the period in which the foot is in the air. Approximates 60% of the floor contact period is for stance and the rest is for swing. 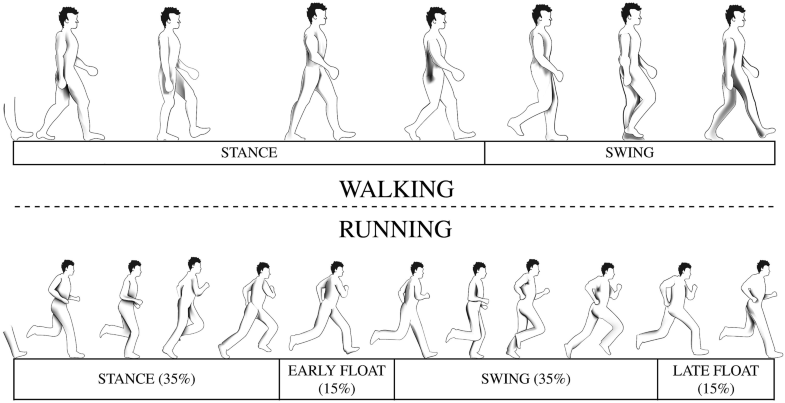 Compared with level ground forward walking, a change in direction or contact terrain increases the requirement on the locomotor system . This increases the demand for both the passenger unit and the locomotor unit. According to the division of body function during walking, the head, neck, trunk, and arms of the body are called the passenger units as they are carried and there is no direct contribution to the walking. 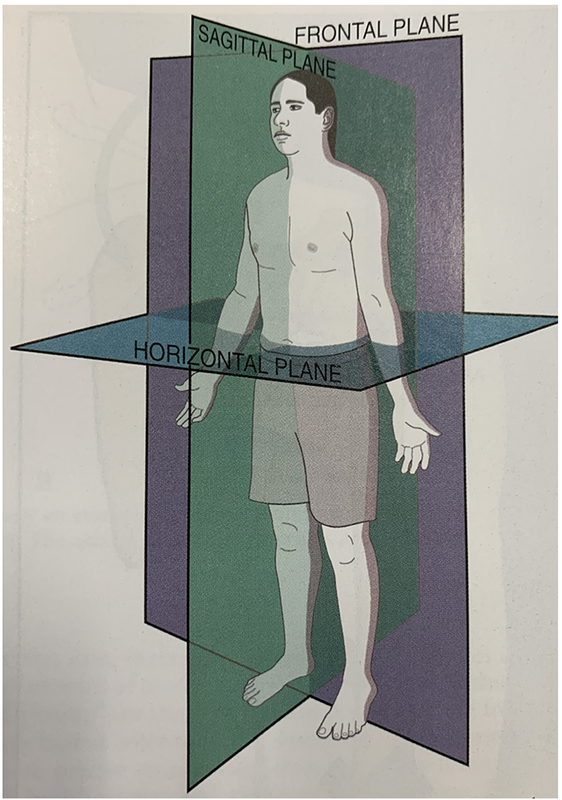 The passenger unit can also be called as HAT (head, arms, trunk) , it represents about 70% of body weight , and the centre of mass (CoM) is located approximately 1/3 of the distance between the hip joint and the shoulder. The muscle groups around the neck and trunk area help an individual to maintain neutral vertebral alignment and postural from the head to the pelvis. Both the passive and active actions of arm swing do not change the energy cost of walking , and the balance of the passenger unit is dependent upon the movement of the locomotor unit. The locomotor unit includes the pelvis and both lower extremities: lumbosacral, bilateral hip, knee, ankle, subtalar, and metatarsophalangeal (MTP) joints. Without the help from any of the above-listed motions, an individual’s body cannot be carried to the desired location. Kinematics is defined as “a branch of mechanics that describes the motion of a body, without regard to the forces or torques that may produce the motion” . When we talk about body motion, the term is not restricted to the entire body, it also includes individual bones or segments. In general, two types of motions are considered here: translation and rotation. The motion of the body is described based on the cardinal planes of the body (Fig. 1): sagittal plane, frontal plane, and horizontal (transverse) plane. Several common osteokinematic terms specific to the body are shown in Table 1. The kinematic measurement requires an objective evaluation of both the motion of the body and individual joints. The assessment of position, angle, displacement, velocity, and acceleration are frequently used to perform in different occasions, e.g. races and rehabilitation. The kinematic analysis is usually conducted by several methods: electrogoniometer, accelerometer, imaging techniques, and electromagnetic tracking devices . The detailed information regarding different measurement methods is shown in Table 2. Different from term kinematic, kinetics is defined as “a branch of the study of mechanics that describes the effect of forces on the body” . Forces act on the musculoskeletal system might cause deformations and injuries . On the other hand, clinicians can use the musculoskeletal torques generated by potential rotations of the joint to train the patient manually. Table 2 shows three different types of device to measure the force and torque of the body. Increasing knowledge related to human movement can be delivered by a series of systematic analyses. In particular, two major approaches are commonly used to investigate the human biomechanics, that is, mathematical modelling and subject experimentation . The experimental approach includes the examination of both a live subject and a cadaver foot, which can also be called as in vivo and in vitro approaches. While the in vivo approach allows the researchers to examine the live subjects, the in vitro approach allows researchers to investigate biomechanical conditions using invasive measurement techniques . Since the first well-developed cadaveric gait simulator was invented as a new dynamic laboratory model for the stance phase of gait in 1998 , the behaviour of the foot and ankle motions can be reproduced. In vitro experiment allows the complete access to all tissues of the foot and lower limbs, and the forces applied to the foot can be fully controlled. Although the current gait simulators can be used as an effective tool to study pathology-specific gait mechanism, some drawbacks such as the lack of specimen specificity of the inputs to the control mechanism remain . Understanding the mechanics of muscle, the geometric relationship between muscles and bones, and the motion of joints is important for clinicians to understand the body movement and to treat movement abnormalities . Even a single human movement is coordinated by many neuromusculoskeletal elements, and abundant data are generated to characterise the human body. It is not easy to use experiments alone to determine how individual muscles or muscle groups contribute to the overall movement, e.g. hard-measurable important variables in experiments, and a difficult-established relationship between a single set of data and complex human dynamic system . OpenSim  is a freely available, open-sourced software system that helps clinicians or other users to create a dynamic simulation platform to model muscles , simulate contact , represent musculoskeletal geometry , and analyse the dynamics of individuals. It also provides a sharable library for the whole biomechanics community to collaborate. Based on the mechanical structures, legged robots can be divided into mammal robots and reptile robots. The mammal robots’ vertical legs are adapted for weight carrying purposes. With the help of joint actuators, the walking speed and stability can be maintained. The bionic research based on mammal robots has become one of the most popular robotics development directions recently. Compliance control strategy has been applied to exoskeleton and robots to improve passive stability and efficiency. Most of the low-impedance and force-controllable actuators are applied with compliance control. An overview of different force-controllable bipedal humanoid robots is provided in the remainder of this section (Table 3). To control the electric motors, the series elastic actuator (SEA)  is designed by putting a spring element in series with the actuator transmission. Different forms of SEA were utilised by humanoid electric robots (Fig. 2) to achieve the motion control . M2 (Fig. 2a)  is the first application platform of linear SEA designed by the MIT Leg Laboratory. It utilised linear ball-screw-driven SEAs with inline die springs in the lower body. Based on the successful design of M2, the Yobotics IHMC M2V2 bipedal robot (Fig. 2b)  was developed using a similar SEA form and instantaneous capture point (ICP) feedback control . Both of the above-mentioned robots can be considered as 3D bipedal walkers . Apart from linear SEAs, plantar SEA-driven robots and the combination of linear and rotary SEAs-driven robots have demonstrated some similar capability of stable walking motions , e.g. HUME by UT Austin (Fig. 2c) and Valkyrie by NASA (Fig. 2e) . The former one is a bipedal robot created in the Human Centered Robotics Lab at UT Austin, and the latter one uses SEAs in a hip, arms, and legs  with possibly the largest sensor package compared with other humanoid robots. As in the introduction to Valkyrie, a rotary SEA is capable of compliant walking. It is an alternative design compared with a linear SEA that consists of a rotary spring and an electric motor. The Atria biped humanoid robot includes two rotary SEAs to drive four bar linkages for the purpose of walking and running . Rotary SEAs have been widely used in the hip, knee, ankle, and other lower limbs to achieve balanced walking in COMAN by IIT (Fig. 2d) . Three years later, in 2016, IIT introduced a new high-performance humanoid platform for the realistic environment: WALK-MAN (Fig. 2f) . The human-like body weight distribution design used four bar linkages to utilise the lower body movement with built-in direct torque measurement . IIT also created a child-sized, open-sourced humanoid robot: iCub, making it capable of whole-body control at each joint . Humanoid robot utilising hydraulic actuators for controllable joints often called hydraulic robots (Fig. 3). Different from traditional electric actuators, hydraulic actuators use hydraulic pressure sensors to maintain closed-loop force control. SARCOS Primus biped system (Fig. 3a) is the first platform to use hydraulic actuation to control the torque and has proven to provide dynamic balancing . The most popular application for hydraulic actuators, Atlas (Fig. 3b) , has been utilised as a working platform for more than ten teams in the Defense Advanced Research Projects Agency (DARPA) Robotics Challenge in the past years . A strong capability of dynamic balancing and whole-body walking control has been demonstrated in the competitions. The new Atlas model (Fig. 3c) reduces the weight and uses the battery to achieve two-handed manipulation. Generally speaking, legged robots can be built with one or more legs. However, an even number of legs has been proven to provide efficient gaits and stable performance . Compared with other legged robots, quadruped robots typically have better locomotion mobility and stability. On the one hand, the quadruped robots can serve as a well-developed platform for the existing systems and controllers. On the other hand, four-legged robots are easier to construct and maintain than robots with six or more legs . 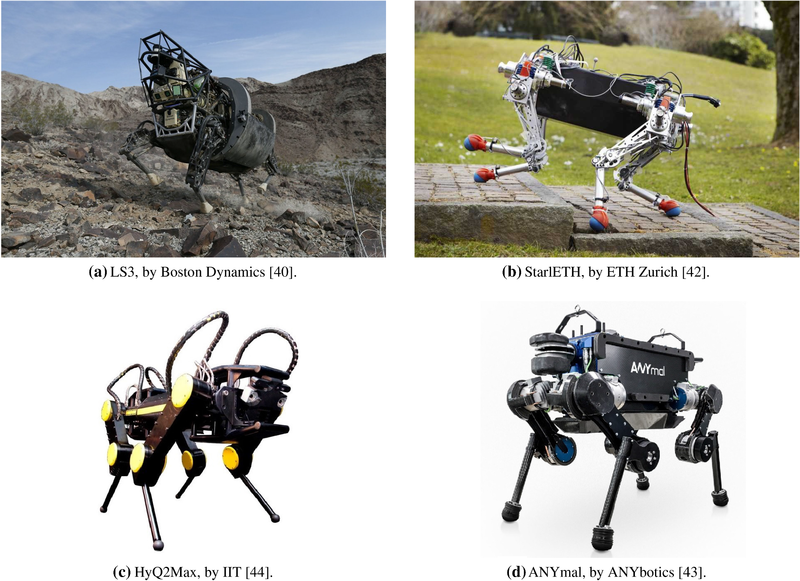 The landmark quadruped robots are introduced in Fig. 4 and compared with the bipedal robots in Table 3. Funded by DARPA and the US Marine Corps, Legged Squad Support Systems (LS3)  was designed to carry heavy loads over a rough terrain. While the IIT HyQ2Max  quadruped robots utilise hydraulic actuation for complaint walking, StarlETH  and ANYmal  choose electric actuators. All of the above-mentioned robots are capable of dynamic walking and jumping manoeuvres. Unlike the bipedal robots, none of the quadruped robots has any specific ankle design and hydraulic actuators are only applied to the heavy loaded ones. Natural human-like walking is one of the most significant challenges since the creation of the first bipedal humanoid robot . Considerable progress has been made so far, e.g. robust control of upright stability, optimisation of walking trajectories, whole-body control over uncertain terrains, and development of low-impedance and force-controllable actuators. Walking control approaches with their application in humanoid robots are briefly described here. As defined in , the zero-moment point (ZMP) is the point on the ground at which the torque produced by the inertial and gravitation forces is parallel to the ground. When the ground is flat, ZMP is the same as the centre of pressure (CoP) . Therefore, the bipedal robot walking system can be considered as the classic cart-table problem . In the ZMP-based trajectory tracking control approaches, an inverse kinematics solver is utilised to determine the joint positions and a fully contained quadratic programme (QP) for model predictive control (MPC) is applied to track desired ZMP trajectories [47, 48, 49]. Most recently, the force-controlled compliant robots use alternative dynamic programming to track the desired ZMP points by a whole-body controller . In addition to active control methods, the passive robot design also played an important role. Similar to the compass walker, a passive dynamic robot can walk in a straight line without any control inputs or actuation . The gravity provides the required energy to the robot to overcome the losses during progression. The passive dynamics approach has proven to overcome some degree of disturbances , and however, for large disturbances, it is hard to achieve the asymptotic stabilisation. Less control action  can help reduce the complexity and to improve the effectiveness of the overall passive dynamic control strategy. In 1997, virtual model control , the first torque-control strategy was developed to achieve the desired robot motions. The new compliance control approaches were developed to meet the increasing needs for robust interaction force control of bipedal robots, e.g. desired momentum rates, certain velocities, and lower joint stiffness. Lower-impedance force controller can help robots exhibit naturally, minimise the impact damage, and offer reliable human interaction in daily life . One of the basic characteristics of walking is to exchange limbs’ support roles when both feet contact the ground . Compared with walking, running can be considered as an advanced locomotor function or a natural extension . However, understanding the walking mechanism does not necessarily mean the understanding of running, and the crucial thing is to study the magnitude of the difference separately. The description of terminology and running paces of recreational runners are introduced here to cover the broadest group of runners. The phases of the running cycle are named stance period, early float period, swing period, and late float period. Float periods only appear in running as both limbs are not simultaneously in contact with the ground, which is what differentiates it from walking . Figure 5 compares the differences in phases between the walking and running cycles. Based on first contact part of the foot to the ground, foot strike is used to classify different patterns, e.g. forefoot strike (FFS), rear-foot strike (RFS), and mid-foot strike (MFS) . As the name suggests, FFS is defined as the pattern when the ball of the foot contacts the ground first, RFS is defined as the pattern when the heel of the foot contacts the ground first, and MFS is defined as the pattern when both the heel and ball contact the ground at the same time. Apart from the above-mentioned traditional classified patterns, natural foot strike (NFS) pattern is defined based on an individual’s foot muscle relaxed mode . There has been a resurgence of interest in investigating the relationship between different foot strike patterns and impact generated injuries . Most of the FFS runner experienced the injuries caused by repeated and rapid impact peak, e.g. injuries of the knee, low back pain, and plantar fasciitis [60, 61, 62]. In general, RFS runners have higher rates of injury than FFS runners, given the Achilles tendinopathies and the stress fractures of the metatarsals are caused by the high magnitude of loading in the forefoot and ankle . While a different foot strike pattern might perform better over certain terrain conditions, the injury rate caused by the impact from the ground is proved to be reduced by applying NFS foot strike patterns in general . In the past ten years, the performance of a humanoid robot has made big strides forward, while significant work is still needed to make the robot more natural and more reliable. It is not hard for a human to recover from disturbances over extreme conditions of terrains without falling. However, for humanoid robots, a feedback controller with MPC controllers is not sufficient to recover from large disturbances without any step adjustment. On the other hand, most of the step adjustment feedback control methods are not suitable and cannot be extended to apply in multi-contact scenarios . The existing bipedal robots already showed their improvement in multiple-motion tasks, i.e. ground reaction force control, step adjustment, and weight movement, but the global optimisation efficiency of every single motion at the same time is still far below expectation. Also, for most of the robots, the replacement of precision parts is one of the major costs in a laboratory or company. The joints such as knees and ankles are extremely easy to wear as the whole-body weight is relying on these articulations during walking or running. Last but not least, most of the robots are tethered to an outside power supply, the performance/standby time of robot is comparably shorter with battery. DRC is perhaps the biggest and the most well-funded robotic competition in the world, where more than 20 teams representing different universities, institutes, or countries showcase their state-of-the-art robotic designs and algorithms on disaster or emergency-response scenarios. Even in this competition, robots are not nearly capable of performing the tasks in one hour, while the same task would take a healthy human only several minutes to complete. This one-hour achievement has been done without considering the human-like gait and overall system efficiency, e.g. extremely bent knees and fixed foot pad. Therefore, the future development of the walking robots can be summarised as three parts: global control efficiency improvement, operation cost reduction, and human-like performance realisation. Current understanding of the human gait is still far from enabling a robot to act like a human. The workload to understand the human gait better and to apply the human gait behaviours to the design of humanoid robots is tremendous. Bipedal robots even extend beyond humanoid robots and exoskeletons can be considered as one of the applications. As we mentioned above, most of the bipedal humanoid robots only focused on walking functions , while a few investigated on running functions . Understanding the differences between walking and running, some companies created the state-of-the-art robots to achieve the running function, e.g. the new Atlas model (Fig. 3c). However, due to the inherent limitation of the existing whole-body controllers, several characteristics are needed to be considered to fulfil the running dynamics system, such as nonlinear multi-body dynamics and high-dimensional compliant locomotion. Complaint ankle rehabilitation robot (CARR) , the wearable robots used for gait training, is an excellent example to apply the robot technology to the rehabilitation field. A variety of ankle rehabilitation devices demonstrated effective achievement in a patient-recovering training . While a humanoid robot has more degrees of freedom than a simple CARR and the adjustment of foot angles increases the control complexity, it is worth enhancing the walking and running experiences by introducing human-inspired ankle and foot structures. Artificial ankle, foot, and lower limbs can help amputees recover from walking disabilities by tailor-made appearance and functions. For instance, one of the bio-inspired robotic devices can mimic the muscles, tendon, and ligaments of the lower limbs , which supports the amputees to walk as normal. However, for uneven ground conditions or heavy weighted amputees, the above-mentioned design might not help in preventing collision transferring through lower limbs. To reduce the potential injuries and shorten the adaptation time, an angle adjustable artificial ankle can be considered as a method to meet the amputees’ needs. 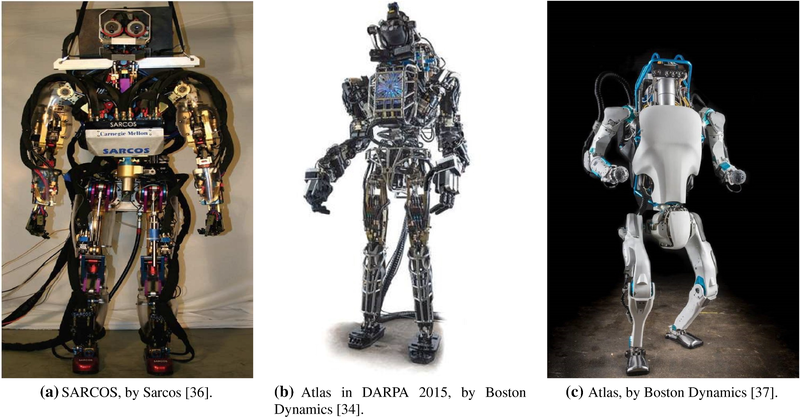 This paper provides an overview of both human movement dynamics and the most representative bipedal humanoid robots in the world. There is no “one-size-fits-all” control strategy or hardware structures to achieve the same natural performance under different extreme scenarios as human beings. 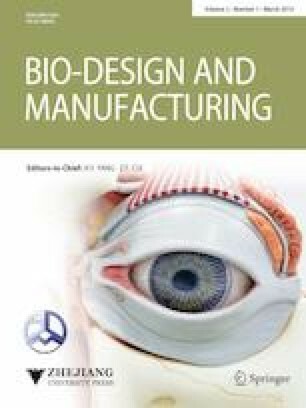 Also, it is important for researchers and engineers to understand the overall human body dynamics before optimising the bio-inspired robot design and control strategies. With this understanding in mind, it is expected that this review could inspire further research on reconstructing the robot’s lower limb structure and redesigning the locomotion control strategies. This work was supported in part by the Research Grants Committee, Hong Kong, through the General Research Fund under Grant 17251716. George H. Z. Liu, Michael Z. Q. Chen, and Yonghua Chen declare that they have no conflict of interest.